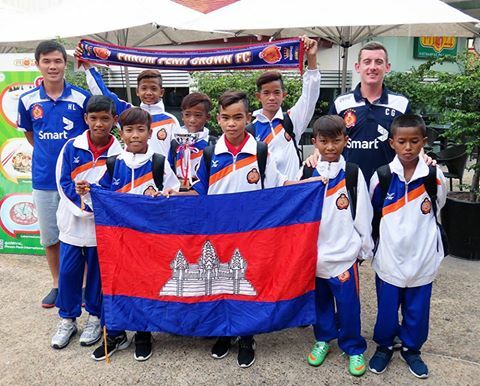 The PPCFC Academy U-14s returned to Phnom Penh International Airport from Singapore at lunchtime today, with their trophy in hand, after their success at the 8th Singapore Soccer Sixes Youth tournament, where they beat teams from Singapore, Timor-Leste, Thailand and Indonesia to collect the trophy for the third time in six attempts. They spoke of a great experience in visiting the city of Singapore and their happiness at winning the competition and making lots of new friends. Coach Christopher Grant and some of the boys spoke to PNN TV on their return to their homeland, which will be shown on television tomorrow morning around 7am. Welcome home to the Singapore Champions!